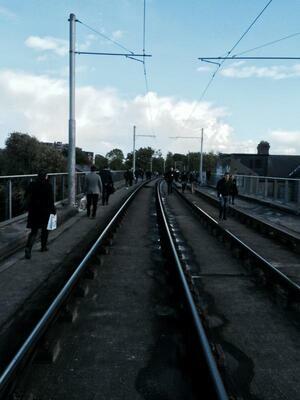 In Dublin, service has been suspended on the whole Luas Green Line until further notice. 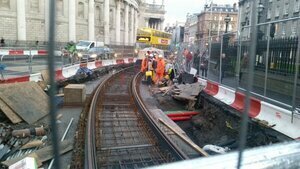 That means there is no tram between St. Stephen’s Green and Brides Glen. A technical fault is reportedly to blame. 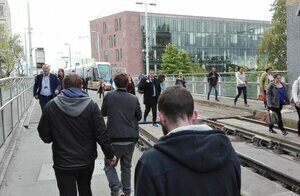 Posted in Misc and tagged Green Line, Luas, suspended at 10:56 am on October 7, 2016 by Broadsheet. What type of half-wit gets elitist about the type of people that get the luas? Go suas ort fhéin, you snob. took two hours to get into work this morning. should have taken 25 minutes. I had a late start and the walk along the tracks was quite relaxing. Cubicle farmers are keeping our economy going and their reward is extortionate rent and spotty public transport. Don’t forget the poor middle eastern english language students residing in the 2n’1/2 grand a month vantage apartments. wow racist much? you know there’s absolutly nothing surrounding these overpriced apartments – no cafes, no restaurants, no services, hardly any shops – and the reason they live there is to be close to the Sandyford RCSI campus. your jealousy is petty and sad. i know right. but he never returns my calls. oh jimmy, aaja! Were there no buses that any of them could have got? 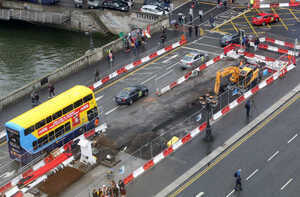 Buses tend not to drive on luas bridges 50 feet above the road. If you use that keen eye of yours you will note the gait of these passengers appears to be ‘walking’ as in, walking to their destination and/or a bus. Lucky I’m not in work today, that’s the second fault this week (the first seemed to scupper any trams going past Sandyford), and the third in recent memory – I had to walk on the lines from Carrickmines to Bride’s Glen about 6 weeks ago.